We are releasing a new solution for RGB LED Control with Control4. There is not so many good and affordable solutions of this kind right now, this driver may fill a gap many people wanted since a while. If you have tried other RGB LED Control solution for Control4 that are on the market right now, you may have find they may produce disappointing results, or other solutions may be better but for a price. The driver we are presenting if focussed mainly to work with RGB LED and use DMX as the standard lightning control protocol. It teams with a powerful interface that is the RS-232 DMX Engine from Engineering Solutions Inc. This little box have enough power to allow a complete management of RGB LED, Color effects, smooth fades, and more. Best of all, it does cost less than the other popular DMX solution for Control4. 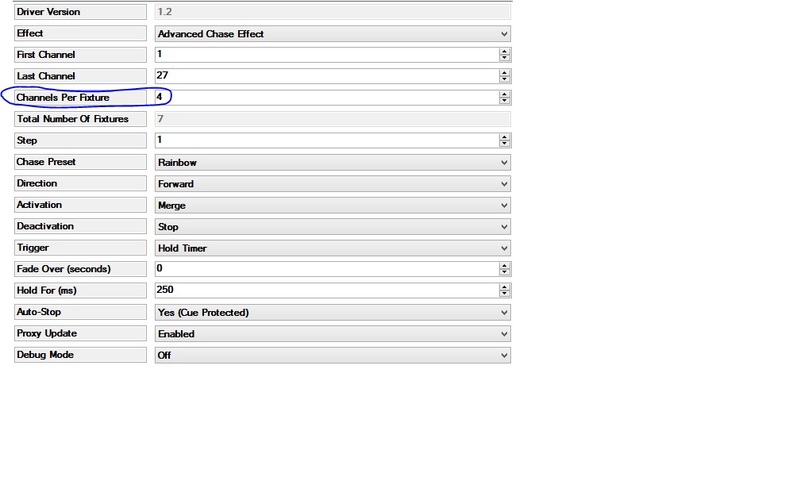 The driver fully support Advanced Lightning Agent scenes with perfectly synchronous activation with no external tool required to build a scene, it also feature a highly user friendly color effect management and native Control4 dimmer control to keep the experience similar the same as with Control4 own lightning system. The total cost of the driver and the interface is lower than the actual most popular DMX solution for Control4 and will produce better results, guarantee. Many people are already using it and they liked it. Feel free to ask question on this forum, we will gladly try our best to answer. It's the simplest way to get a fully functional DMX system out of the box. I'm interested in using this driver for an RGBW install. Assuming a single 4ch dmx decoder is used to run a chain of RGBW strips, how is the 4th channel (white) treated in relation to the RGB (1-3) channels? Can all four channels be ON simultaneously or does channel 4 override (turn off) channels 1 through 3? You can configure an RGB dimmer on the 3 channels and do a separate single channel dmx dimmer driver for the white channel. So there will be 2 drivers in composer controlling 1 dmx driver that has 4 channels. This solution works REALLY well by the way. That makes sense. I'm curious how a chase sequence would be programmed, using only the RGB channels, if the DMX decoders are 4 channels (4th being white)? The scenario would be two 4CH DMX decoders controlling two RGBW strips with sequential DMX addresses (1-4 and 5-9 with 4 and 9 being White). Can the chase run through channels 1-3 then 5-8 while skipping the white channels (4 and 9)? Be careful assuming. Many RGBW strips have a shared +12v across all four which potentially you can't use two seperate decoders (will depend on the decoders, hoe they are powred etc). Also make sure if you have a 4channel decoder that it is in fact 4 true channels, I've had several where the 4th channel is not a true connected channel (even though it had connectors!!!) but the 4th channel is a master channel for overal brightness. Personally I prefer using a standard RGB decoder and putting white with blue (or any color) on a relay - blue out from decoder to COM, NO/NC to White/Blue. This works fine with the EV driver (as it allows channel setting and having channels nrs more than once) - I cannot say if it works on the one this thread refers to. Note - does require some added programming of course to switch the relay and force virtual master channels to go to 100% on turning on (if you use it). Or, if you only want on/off on the white, use a relay for the white to begin with - free drivers are available to have it show as a light. As not to assume again, can anyone confirm that I can use a DMX splitter with both the RS-232 DMX option and the Enttec IP DMX option. I am not able to daisy chain all of the DMX encoders. The Enttec I can confirm (or DMXking eDMX with the same driver ) you can. This will instruct the driver to skip any extra channel that follow the first three (R-G-B ). This new function was added to create RGB chase over RGBW fixtures or commercial stage lights that often use extra channels next to the first R-G-B for built-in effect. Just IMHO, this solution was way better than the entec for my purposes. No popcorn, great effects awesome dimming capabilities, affordable. I put in an itach rs232 to ip global cache since I didn't have an extra serial port on the HC800 in the theater and it works fine. Again, just my 2 cents, since I tried the entec and it was horrible with dimming., plus expensive. Mark, have you used the GC Universal Driver with your iTach? I saw some issue with two-way communication when using the Universal driver with the DMX interface, the fix is to use the GC-100 driver and it work perfectly, even with an iTach. Also, to add some cheap RGB lightning to any room, try recessed ceiling RGB(w) lights, it's cheap, reliable, require only basic retrofitable cabling and provide limitless color effect options.. Yes, we used the GC universal driver. Works fine. I'm not seeing any issues at this point after about 6 months of working. Stangely, a guy on this forum already done a driver for that in the past and was looking for people to test, but soon after he disapear and never gave any update on his project. It's cheap china stuff, can do basic color change but will never be able to fade at specific delay or integrate correctly with scenes. But I think it still worth trying to integrate them into C4, even with basic functions, it will still be able to turn "Blue" if you want you room to be blue so that may fit a need some people have, without having to bug with retrofit cabling. What about any of these Zigbee lights? Have you looked at these Jackstone? http://www.zigbee.org/Products/ByStandard/ZigBeeLightLink.aspx I'd rather have a zigbee connected bulb than a wifi enabled. Also, I want to ensure that any of the lights can be turned on with a switch versus having to use an app or control4. So bad C4 does not use "standard" Zigbee radio, this could enable the native control over those nice ZigBee bulbs... Using their getaway would be an option but this will still rely on the network to communicate, not a big deal if it is wired. Any bulb radio controlled that does not rely on a "cloud" service can be integrated in C4 in some way. We just need to find witch one's the best bang for the bucks. Will try the Mi Light right now because it's the cheapest bulb available now, we may be able to use the same template for the Zigbee version using the gateway. I'll keep you posted. Meanwhile we are releasing our latest version of the DMX RGB LED control solution. All people using version 1.0 or 1.1 can upgrade for free to 1.2, the license code is the same. I will soon post a video showing Sound-To-Light in action. DMX LED Control recommended decoders. I need to post something about that because there is a LOT of cheap DMX decoders on the market and they don't work all well when dimming and controlling LEDs. Note that commercial stage light with built-in decoder are always the best choice for perfectly smooth fades and effect, but when you want to control Low Voltage LED recessed ceiling light or LED strips, you need to choose the right decoder if you want the best results. #1 Recommended model, the PX24500. A $20 eBay China decoder that perform incredibly well, it also provide hi-current output for up to 5a per channel and easy daisy-chain using cat.5 cables. Best fades and flicker-free dims that almost rival Stage Lights. #2 Recommended model, the PX24506. A bit cheaper than the 24500, it perform correctly. Not as smooth as the 25400 but OK for most project. This is the worst of all. Look practical to get 24 channels in a single box but no, it does not worth it! It perform so bad dimming LED, it flicks and fades are nothing else than choppy and ugly. Trust me, don't use this one! This one is not as bad as his 24ch big brother, but it is surely not recommended. It does not flick when dimming but it's all but smooth. Choppy color change and not very robust. Don't use this one too! This decoder is supposed to be able to address a 3 DMX channel per pixel but has only a single set of PWM transistors to dim the whole pixel set. Result is a VERY choppy dimming and color change because the PWM need to dim all channel one at a time. This is NOT the right decoder if you to work with pixel strip. LED Pixel must be driven with powerful commercial-grade decoder made especially for that purpose. What's new in the driver Jackstone besides light to sound? It basically make the light react to the music played over the Control4 controller or any other audio source, even live Internet radio stream, using only Control4 hardware. Very nice for party night. All other new features are described in the earlier post, the most notable are the Group RGB Dimmer and the external trigger w/ Sound-To-Light. LimitlessLED / Mi-Light Wi-Fi driver update. Yes, it'll work. I have built a basic driver to connect the Wi-Fi hub and it's pretty easy to control the LED bulbs once they are paired with the hub. This system is pretty limited though, only 4 channel per hub, you can group bulbs together but with C4, this could end up messing things up when you want to use scene. There is no limit of the number of hubs to use so in theory there's no limit of the number of bulbs to control if you're not afraid of frying your brain through all those radio frequencies. Very basic scene support to expect, the bulb does not support the "Ramp To" command, only one ramp rate available which is the default rate you see when you turn of the bulb with an iPhone. Popcorn effect to expect when using scenes, or use the bulb grouping function of the system, although this will disable the control over each individual bulb of the group. Color Change will be only the built-in function of the bulb, not possible to build some custom color changes over C4 because this will eat up too much CPU and the Wi-Fi hub is simply not built to received a continuous stream of commands. id love to see the video of it doing effects to music!